Architectural zinc adds to beauty, sustainability of two projects. January 17, 2012 (Raleigh, NC) — Two of the nine projects from around the world that recently received 2012 Honor Awards from the American Institute of Architects (AIA) feature VMZINC® exteriors. 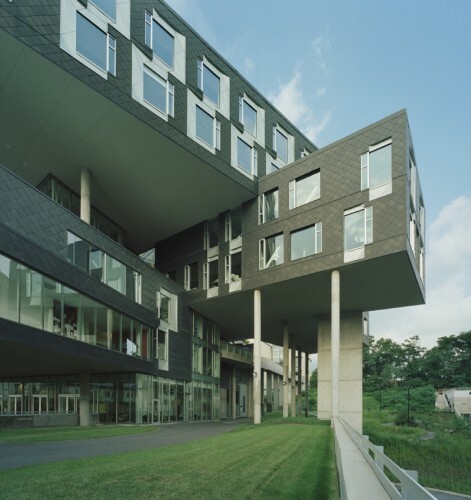 The award-winning Carnegie Mellon University’s Gates Center for Computer Science and the Hillman Center for Future-Generation Technologies were designed by Mack Scogin Merrill Elam Architects of Atlanta, Ga., with attention to energy and water conservation and other sustainable practices. Last year, both centers received LEED® Gold certification. The use of architectural zinc contributed to the certification because zinc is manufactured using very little energy, it lasts an average of 80 years with very little maintenance, and it is completely recyclable, both during construction (construction scraps) and at the end of its use. Another award-winning project with a VMZINC exterior is The Poetry Foundation in Chicago, designed by John Ronan Architects. The building’s outer layer is VMZINC’s black ANTHRA-ZINC®. Since transparency was an important issue in the design, the ANTHRA-ZINC is perforated where it borders the garden, allowing visual access to the garden from the street. Inside the garden, the zinc screen wall internalizes the garden experience and provides a sense of removal. The Poetry Foundation was featured in Architectural Record in November prior to winning one of this year’s AIA Honor Awards. For more information on the 2012 AIA Honor Awards, go to www.aia.org/practicing/awards/2012/architecture. For more information on VMZINC, visit www.vmzinc-us.com. Umicore Building Products is a world-leading producer of architectural zinc. For over 160 years, Umicore has been providing innovative solutions for building owners, architects and contractors. Umicore has offices and representatives all over the world. In the United States, Umicore Building Products USA, Inc., is based in Raleigh, NC. For additional information, visit www.vmzinc-us.com. VMZINC also maintains the blog ZINCsense (www.zincsense.com) and an active Facebook page. To answer questions about metal roofing and installation. October 17, 2011 (Raleigh, NC) – Melissa Dolak-Keller, a territory manager for Umicore Building Products USA, the manufacturer of VMZINC®, has been appointed to the Metal Roofing Alliance’s Ask-The-Expert Forum panel. Ask-The-Expert is a forum for exchanging information concerning residential metal roofing, including general material and metal roofing installation questions. Architects, contractors, and installers post metal roofing questions and members of the panel of contributors provide the answers. Dolak-Keller is one of Umicore Building Product’s territory managers for the Northeastern states and Texas, along with Alex Pittman and Bryan Ninneman. She has been with the company for five years in a variety of roles, and is now responsible for meeting with architects and installers, giving presentations on metal roofing and reviewing details. The Metal Roofing Alliance (MRA) was formed in 1998 by a small group of metal roofing manufacturers to educate consumers about the benefits of metal roofing. The Ask-The-Expert Forum is located on MRA’s website at www.metalroofing.com/v2/forums. For more information on Umicore Building Products and VMZINC, visit www.vmzinc-us.com.